I have to admit that I’m always watching out for places to buy chocolate and other sweets when I’m on a trip. But lately I have added something completely different to my list of must have items – bars of soap. I came upon this quite accidentally when I was in Switzerland. I was in a grocery store to buy something ordinary like toothpaste. 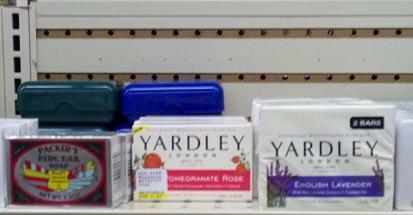 I was browsing the shelves and seeing all the familiar brands when I noticed there were rows of soaps in attractive packaging. They were locally made and had simple, easy-to-understand ingredients like milk, honey, and lavender. When I picked one up for a closer look I was surprised that it was so reasonably priced. It was so hard to decide which bar of soap to buy that I ended up purchasing several of them, with the idea that I could test them out at the hotel. After all, the bars of soap that you get at hotels are so tiny that they are used up the first time you wash your hands. I thought that I would use one and keep the scented ones in my dresser drawers as sachets. The soap I picked to use was creamy and mild, and it lasted my entire trip (two weeks). This experience was the inspiration for my latest tradition of looking for soaps on every trip I take. So while I was in Sorrento, Italy, I bought lemon- and lime- shaped (and scented) soaps that were wrapped in cellophane. In Venice I bought bars of olive oil soap. In France I found huge bars of lavender scented soap. And now when I visit a grocery store on trips in search of snacks and chocolate, I investigate the soap section, too. Sometimes I think that these soaps would make nice gifts, but I like them so much I just can’t part with them. Once I get home I put them in my drawers because I don’t want to actually use them as soap! And really, the nicest thing is that I can be rummaging in a drawer looking for a scarf when I will discover one of these soaps. Then I remember where I bought it, and all the good memories come back. This entry was posted in Sorrento, Travel, Venice and tagged chocolate, scarves, souvenir shopping. Bookmark the permalink. Well said, Rachael. It makes opening a drawer a little travel adventure! I love buying functional gifts for my friends when I am travelling! Last year when I was in Toulouse I bought violette soaps for everyone and they loved it! I just finally started to use my bar after an entire year. 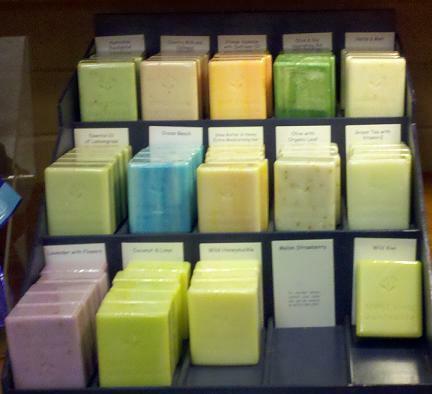 Soaps make lovely gifts! I think that they are very versatile and can be arranged in baskets or used as sachets. So I wait to use them, too! Ah I buy soap when i travel as well! I think that soap makes a great souvenir, and you could actually use it, too!